Volunteers and international students performing during the open mic night hosted by International Student Fellowship on November 28 at Evans Commons. 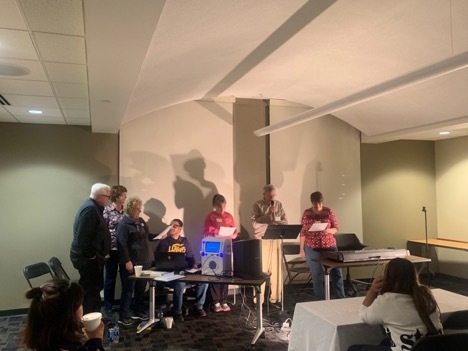 Volunteers, international student, and attendees were able to show their talents on stage during International Student Fellowship’s open mic night Wednesday in Evans Commons. Schaeffer also said there are always surprises from the “least likely” people. Pawonee Khadka (left) and Asuka Oka (right) perform “Rolling in the Deep” by Adele during the open mic night hosted by International Student Fellowship on Nov. 28 in Evans Commons. The performers sang karaoke, gave speeches, read poetry and played instruments. Dawn Forbes, an International Student Fellowship volunteer, said she loved how the arts are appreciated by all, no matter where one is from in this small world. Pawonee Khadka, from Nepal, said she attended the mic night for the past two years, but had never performed before because she is shy. “However, my friend is graduating, so she was like ‘We need to perform together,’ and I couldn’t say no,” Khadka said. International students and volunteers also get to learn about popular songs from each other’s generations. The students typically sing more modern songs, while the volunteers sang some oldies. People in the event got to perform whatever they wanted because the point was to have fun and laugh.